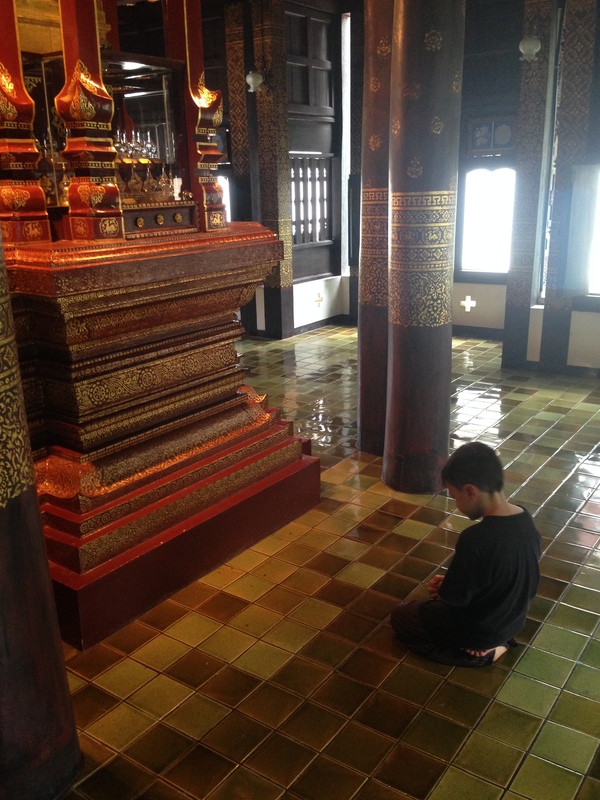 There are countless wats (temples) to visit while in Chiang Mai. I knew the attention span of the kids when it comes to architecture was pretty small so I had to pick my favorites to visit. 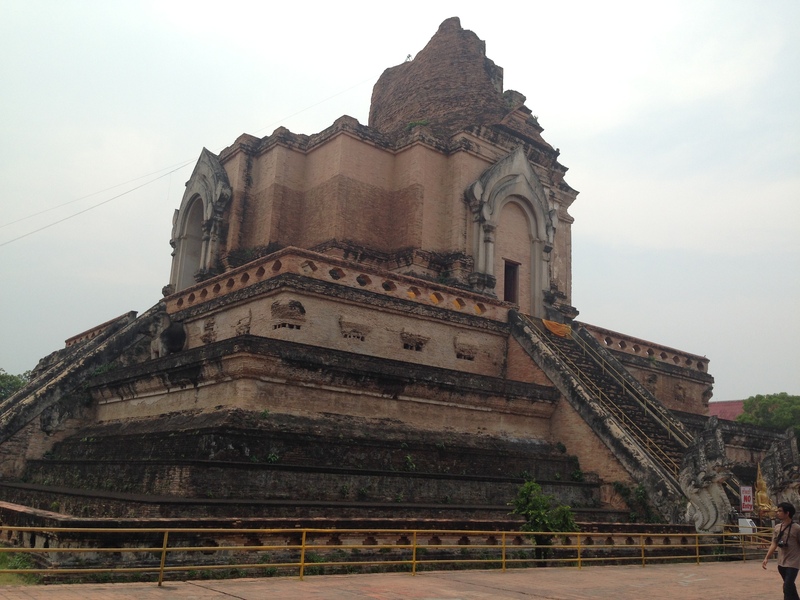 After lengthy web browsing I settled on Wat Chedi Luang and Wat Phra Singh. To get to these wats you have to enter the old part of the city which used to be surrounded by a beautiful brick wall. There are few places where there is still some part of the wall left. 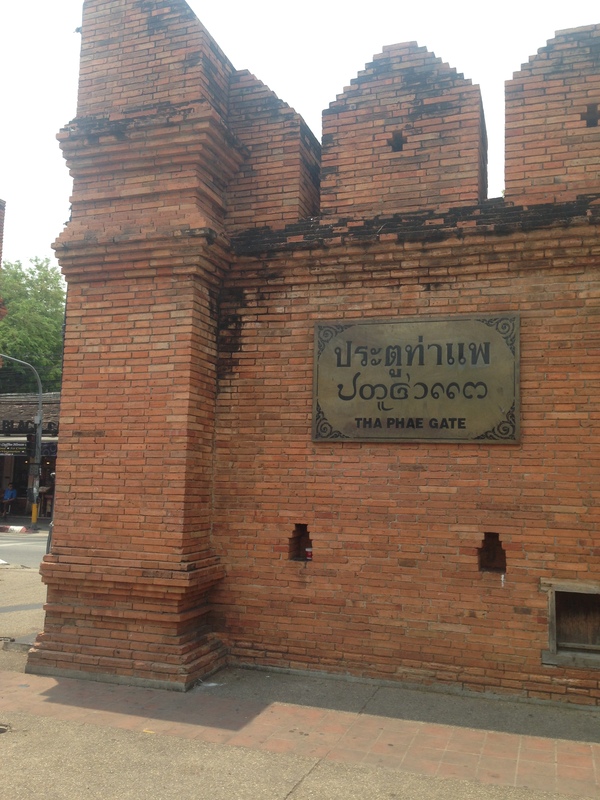 Tha Pae Gate has been reconstructed to resemble the original inner gate called Chiang Ruak Gate which was demolished in the early 20th century. 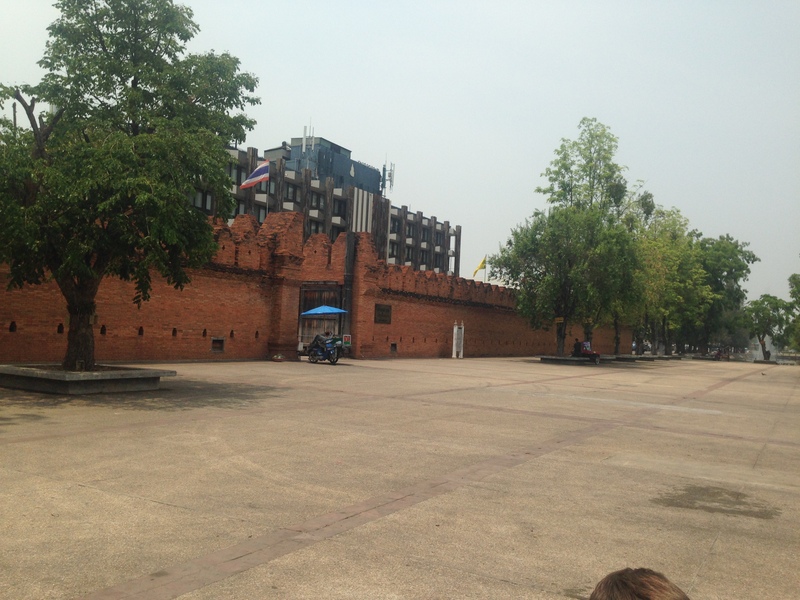 After taking a tuk-tuck or songthaew to the entrance you can walk through and meander the streets of the old city if you like. Or you can have your driver deliver you directly to the wat you’d like to see. The inner city isn’t that big but it’s very busy. Once you combine the traffic with the heat, it might be a better idea to go straight there unless you are walking around during the morning or evening hours when it’s cooler. If you decide to walk, the maps are pretty clear and the street are relatively easy to figure out. 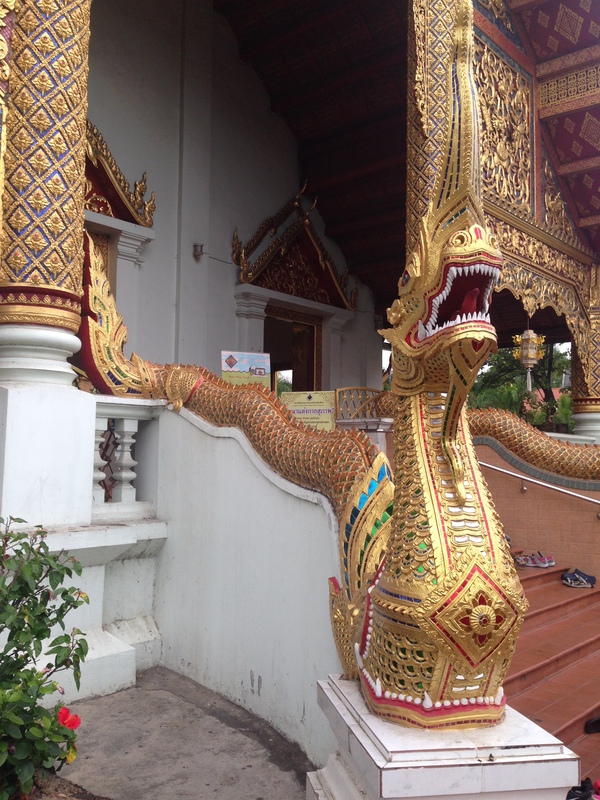 This was the first wat we went to here in Chiang Mai and is considered one of the city’s most important temples. It is slowly being restored and you are unable to enter the actual pagoda, but there are other wats and temples you can actually go in to. The temple grounds also offer Monk Chat where you can sit with some monks and ask them any questions you’d like. 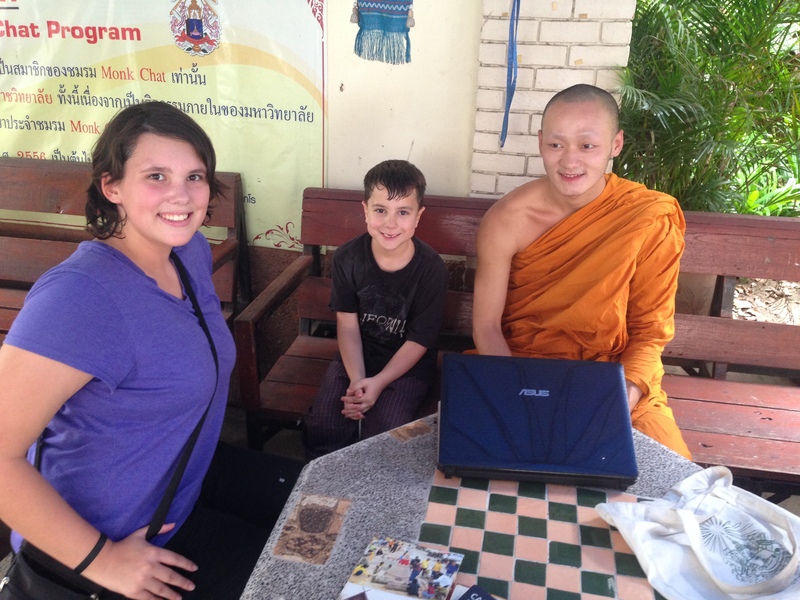 We enjoyed sitting with this young college monk and talking about Buddhism. We found out that they don’t worship Buddha, they become buddha. It’s more like a verb instead of a noun. It’s something that every man is expected to do once in his life, either for a day or longer. It helps him become a better person, husband, and man. 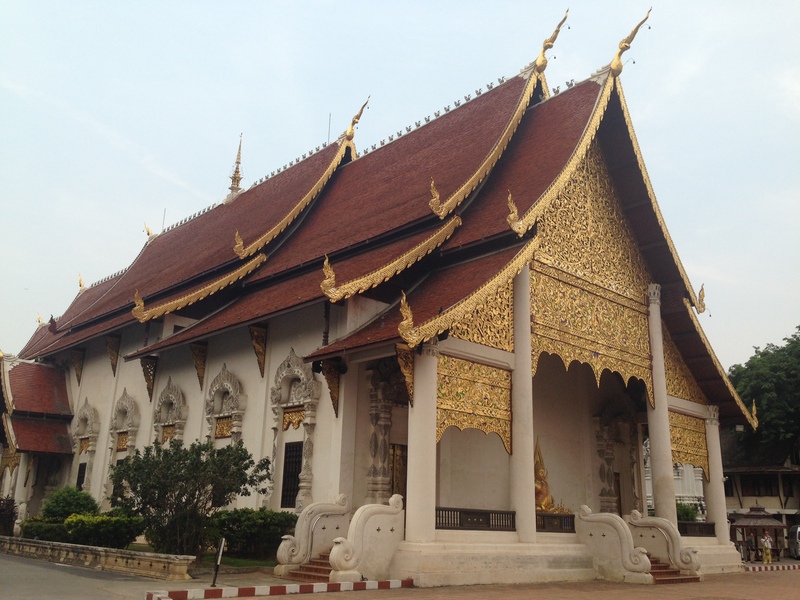 This is Chiang Mai’s most visited temple because it houses their most revered Buddha image. The grounds are nice and shady and covered in thought provoking messages. However, this was our last stop and the natives were restless, so we didn’t stay long! One dish that was suggested for us to try before leaving Chiang Mai was Khao Soi. 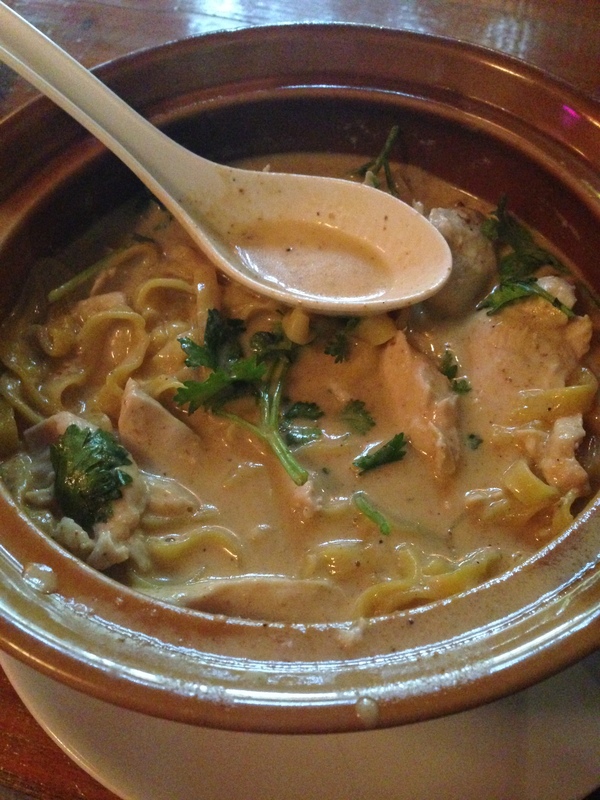 It is a mouth watering bowl of egg noodles with a chicken leg and covered in a mild coconut curry. It is topped with crispy noodles and has a variety of vegetables in it, usually cabbage and shallots. It was SO good. So, if you visit Chiang Mai, the must do’s are Wats, gates, and Khao Soi!! You are blessed to be able to experience these things (and your kids are super blessed)! What a gift! i completely agree! we praise our thanks daily to have this gift of a life.